I have a fun card to share today featuring Mr. Santa and his list. I just love this die cut…so many fun things you can do with this! I elected to make the let the die cut be the star and just added a few fun elements to set it off. The base of the card front is a piece of Candy Cane Lane DSP cut to fit the whole card front (5 1/2 x 4 1/4). 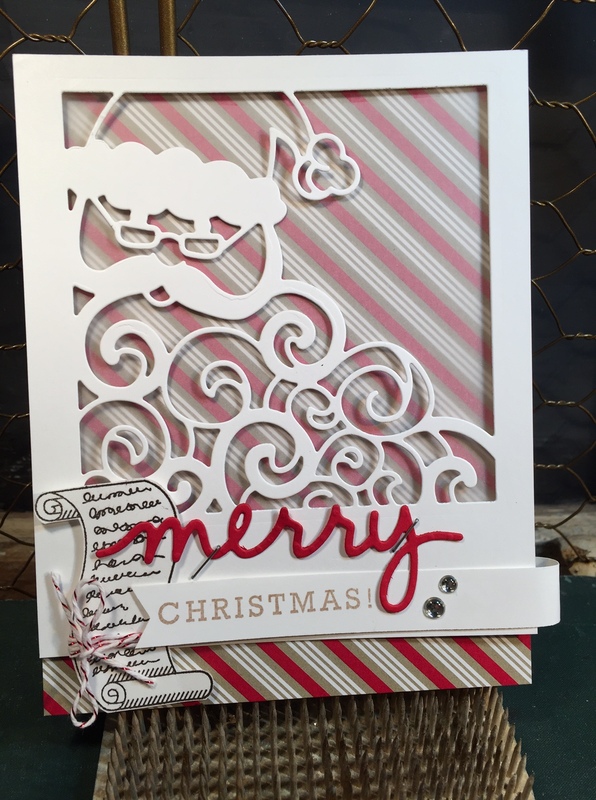 Layered over the DSP and under Santa is a piece of vellum that gives a softer look to the DSP under the die cut. Add ons are the cute list image stamped in Early Espresso and fussy cut. The list is wrapped in Candy Cane Lane Baker’s Twine and tied off with a tiny bow. “Merry” is die cut with the Christmas Greetings Thinlit in Real Red. The “Christmas!” portion of the sentiment is masked to exclude the “Merry” on the stamp and stamped in Crumb Cake on a 1/2″ x 4″ piece of Whisper White. The right edge of the banner wraps around on the right side and goes behind the card front. It’s hard to believe it is really almost Christmas again! I hope you are enjoying time with your family this week for Thanksgiving and maybe getting in a little crafting too! This entry was posted in Big Shot, Cards, Framelits Dies, Stampin' Up and tagged Christmas Cards, Detailed Santa Thinlits Dies, Greetings from Santa, Stampin' Up by kate80132. Bookmark the permalink.